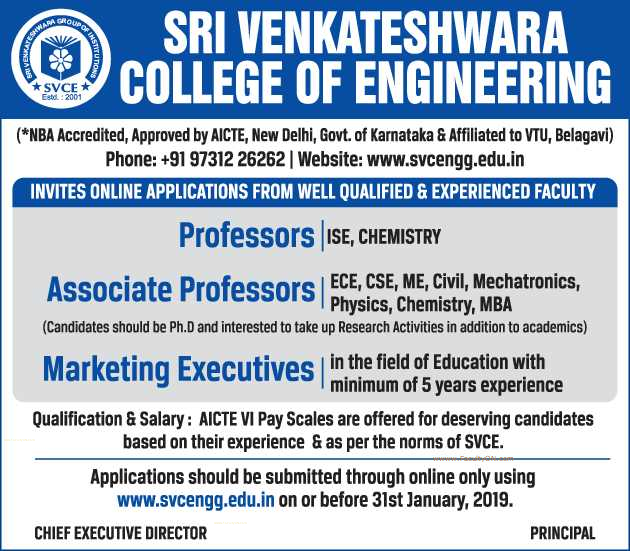 Sri Venkateshwara College of Engineering, Bangalore has advertised in THE HINDU newspaper for the recruitment of Teaching Faculty- Professor / Associate Professor Plus Non-Faculty jobs vacancies. Interested and eligible job aspirants are requested to apply on or before 31st January 2019 . Check out further more details below. College Profile: Sri Venkateshwara College of Engineering is a leader in technical education and in the development of ideas that shape the world's understanding of engineers. We are proud of our position as the top academic college of engineering and proud of the people who make it so - our students, faculty, staff and the management. Bengalore - 562 157, Karnataka, India.